Easily missed. Depends what you want. More of a pub than a bar which is unusual for the area. Good place for watching sport/football - rarely gets too busy but also have efficient and very friendly bar staff. Good value as well. In my experience though, and I'm usually a beer drinker, the quality of the bitter is indifferent at best here - I like the place but drink lager or cider here so am marking it down to a 7 because of the mediocre beer quality. As a previous poster said, front of the pub is almost hidden it is so unimposing, and I walked past before realising I'd missed it. Busy-ish with the afterwork crowd when I popped in on Friday evening. Two ales on tap - Deuchars and Santa's Little Helper, with the latter very drinkable and �3.45 for a pint. Food was on offer, but all I can tell you is that crisps were 90p a bag. Okay enough for a couple of beers, but not somewhere you'd spend all night. 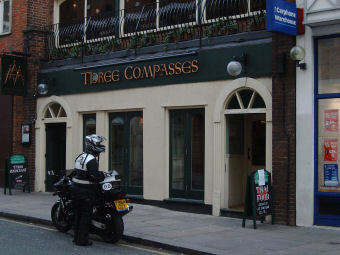 Just down the road from Farringdon tube the Three Compasses has a fairly small unimposing street front that leads into a larger room than expected. It's pretty bland though and almost "All Bar Oneish" in environment. A couple of plasma screens on the walls provide the sports entertainment. The clientele were mainly suits in for an after work pint and quite frankly they're welcome to it. I was in here after work a few days ago. Quite liked it. Half busy, good vibe and tasty beer. Will be returning.